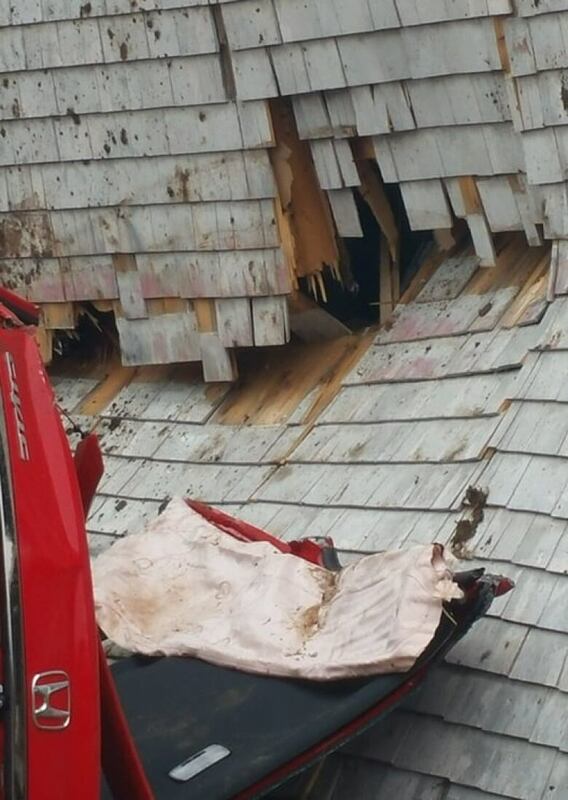 Tonya Ward and her family were just waking up Saturday morning when a car crashed into their farmhouse in Centreville, N.S. She describes the dramatic moments that followed and warns that another incident could happen. It was a violent start to the weekend for a family in Kings County, N.S. 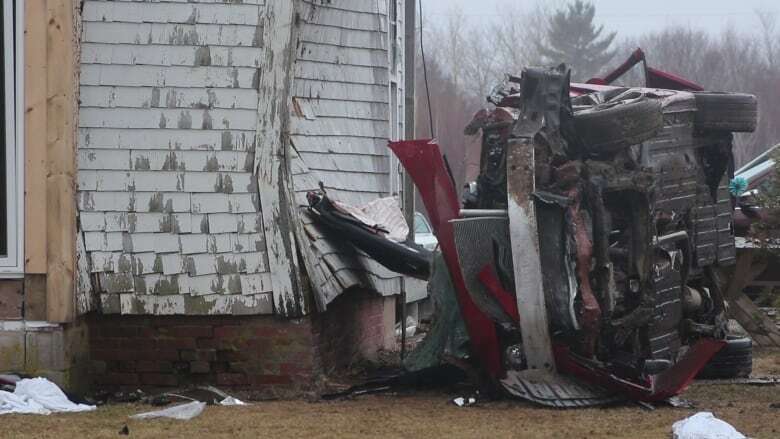 Tonya Ward and her family were just waking up Saturday morning when a car crashed into their farmhouse in Centreville. Her youngest daughter had taken the family dog outside and just left the area where the crash occurred, Ward told CBC's Maritime Noon. "She actually had just come into our room to wake us up," Ward said. Then there was a noise like the "sound of a bomb or an earthquake going off" and what looked like a rock smashed through the bedroom window. It was later determined the object was a clump of mud propelled by the impact. "We immediately spun out of bed and tried to figure out what the noise was," Ward said. "We could hear my grandmother downstairs hollering for help." She and her husband Nick Stern ran downstairs. "We saw that her door had been taken off the hinges and was thrown in through our hallway, up against the far side of that room," Ward said. "There was a dresser blocking her in and a complete haze of smoke. We couldn't see into her room. We couldn't see her. I could hear her. She was saying there's been an accident. I was screaming for her." Light was streaming through what appeared to be a hole in the wall that penetrated both the interior and exterior of the farmhouse. 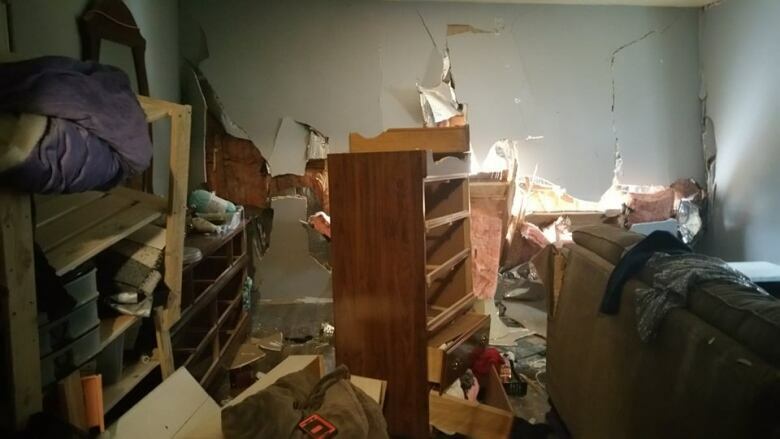 Ward's grandmother had been sleeping on a couch that was up against the wall the car struck, but the impact propelled the couch and the woman across the room. Ward found her grandmother with a dresser drawer on top of her. "She managed to get up," Ward said. "I told her to sit on the coach. I was unsure at that point in time what was structurally safe to move because of the severe damage that I could not see in the room. I was scared to move anything for fear that something would fall on her." Ward called 911 and then telephoned other family members for help. The older woman was taken to hospital by ambulance and released after it was determined she hadn't suffered any broken bones or other injuries. Ward ventured outside, unsure if anyone in the car was alive at that point. The car was on its side, with the passenger side facing down, she said. "You could see where it had impacted the house and even left a paint line completely across the house," Ward said. "Speed was a huge factor. It is about 120 feet from where the car initially went off the road to where it hurled itself into the side of our home." While the driver had already removed himself from the vehicle, a male passenger was still inside it. "It did not appear to me that the gentleman was going to survive," Ward said. "And again by some miracle, to my understanding, he's actually been released from the hospital. It was graphic and something that you would see out of a Hollywood film." 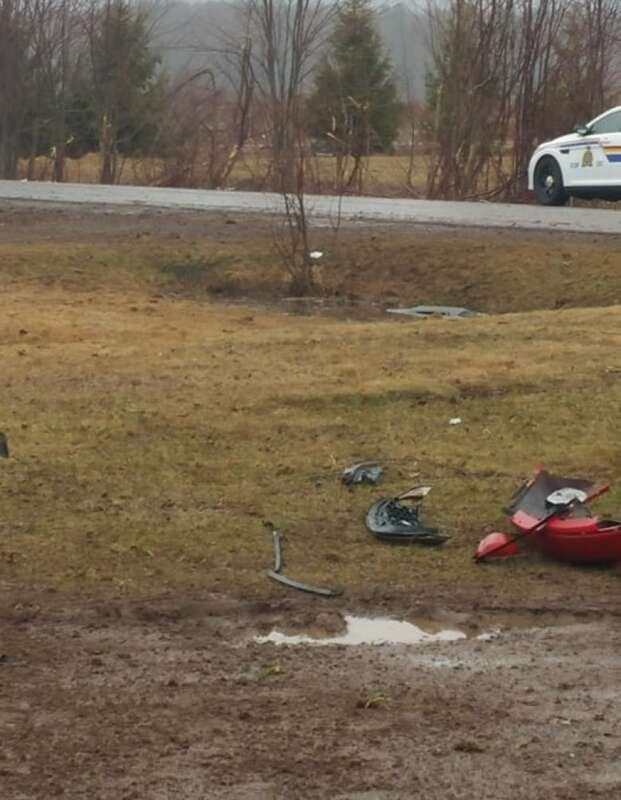 RCMP said both men suffered serious injuries, but are expected to survive. The crash caused extensive damage to the side of the home. Ward said for the past seven months, the 200-year-old home was being renovated. It's not yet clear what will be need to be repaired or completely rebuilt. Ward said the structural integrity of part of the house has been affected because the house moved between 10 and 15 centimetres off the foundation because of the collision. Passersby trying to get a peek at the crash site are now making the scene even more unsafe, Ward said. "People are stopping on the road in front of the house to view the damages," she said. "And we've witnessed two [incidents] very close to being accidents. "Let's not lose lives, where we got through one accident with no lives lost. Let's not do things that are going to cause another accident, so it's a huge concern for us with all these people stopping directly on the road." The family's privacy has also been affected as there have been a few instances where the family has come home to find people parked in their yard and walking around their home. "This is upsetting to our children and our animals who have already been through a great amount of trauma," Ward said. She said it's not the first time there has been a crash on the corner of the road near the home. "I do believe that that corner still plays a huge role in it," Ward said. "Vehicles either end up in the ditch across from our house or they end up on our property. 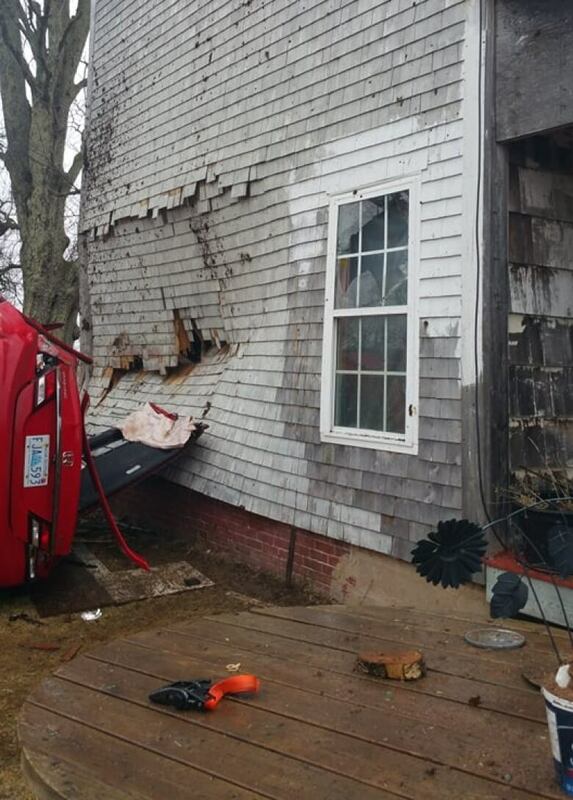 Thankfully, this is the first time we've had a full vehicle impact on the house. But we have had car batteries, we have had rims. We've had vehicle debris hit the side of the house and it is a yearly occurrence."